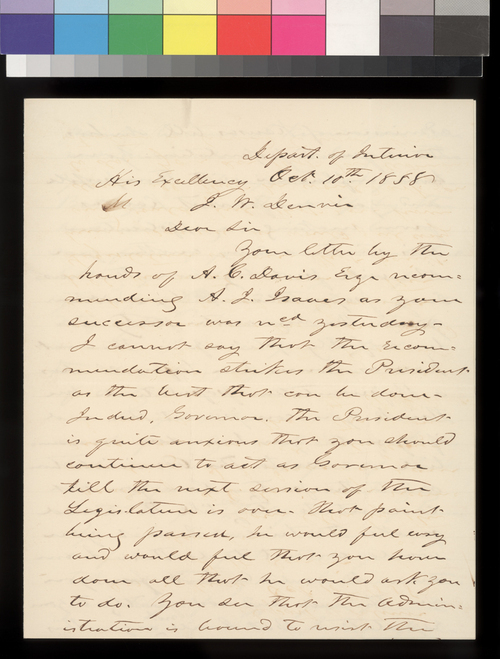 Thompson, writing from the Department of Interior in Washington, D.C., to Governor James W. Denver, urges Denver to remain in the position of territorial governor as a service to the Buchanan Administration and the Democratic party. Thompson indicates that President Buchanan believes Denver could prevent Kansas from seeking admission to the union until it had "the requisite population." Denver, in spite of Thompson's appeal, left office on October 10, 1858.